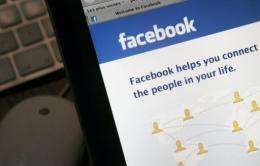 Internet security firm Sophos has warned Facebook users to be on the alert for a scam which sends a spam message to all of their friends on the social network. Sophos, in a pair of blog posts late Monday, said "hundreds of thousands" of Facebook users have fallen for the scam which it dubbed "likejacking." It said some Facebook users had received a message such as "This man takes a picture of himself EVERYDAY for 8 YEARS!!" and were encouraged to click on a link. Sophos said clicking on the link takes a Facebook user to what appears to be a blank page with a "Click here to continue" message. Sophos said clicking on the page publishes the original message on their own Facebook page with a "like" notation and recommends it to all of their Facebook friends. "This of course posts a message to your newsfeed, your friends see it and click on it, and so it spreads," Sophos said. Sophos warned last week about a Facebook scam designed to trick users into installing adware, a software package that automatically plays, displays or downloads advertisements to their computer. That followed a similar scam that spread on Facebook the week before involving a fake posting tagged as the "sexiest video ever," according to Sophos.